On 31 st October Bellavista care home had a Halloween themed day . Reka and the residents enjoyed carving pumpkins in the morning as well as Khadija our new activity assistant was making food decorations with another volunteer girl also called Khadija. We were making all these preparations ready for the Halloween party in the afternoon. Later in the afternoon we enjoyed the Halloween party with the residents and family members. We had great music and food, which we decorated in a Halloween theme. 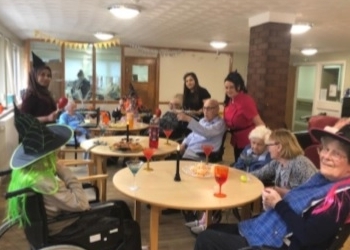 Staff, residents and their relatives, along with residents from other local care homes, took to the floor dressed as witches and other classic Halloween characters. They also played traditional Halloween games and tucked into a selection of themed snacks and beverages. We all had a great time and we can’t wait for the next celebration!